Lisa Gail Green was one of the first and best people I met in the blogosphere. She was a badass writer, already agented by a badass agent, and I remember being so excited when she did a guest post on Adventures. We got to know each other and started exchanging manuscripts, and the very first thing I read was the book that she is releasing tomorrow. That was years ago, but I remember it like it was yesterday. I had just finished reading PARANORMALLY and PERSONAL DEMONS and Lisa's book blew me away. I loved it. I loved the humor and the romance, the originality of her story. The way her brain works humbles me--she's amazing. 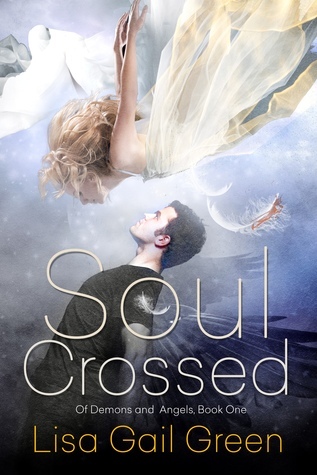 In honor of SOUL CROSSED's release tomorrow I'm doing a SUPER giveaway, including SEVEN SIGNED books by authors like Ally Condie, Jennifer Armentrout, Ellen Hopkins, Jennifer Donelly and Maggie Stiefvater. Is that enough? NO. I also am giving away a giftcard, swag, and another book! So don't forget to enter!! Am I crazy? Well, that's besides the point. The thing is I value all of YOU and I want to honor all the readers out there. Now to the post! Tomorrow my baby is out in the big wide world, but guess what? It didn't happen overnight. Shocked? Probably not! Most of us are familiar with the torturous wait and seemingly inescapable lessons in patience associated with writing. Five years ago I had an agent (and I mean uber agent) and had every expectation that I'd soon be hearing about an offer from one of the "big five". Ha! Lesson number one - just because you have an agent, there's no guarantee of publication. Things kind of went South from there instead North. My agent and I split amicably and I was faced with starting "all over". Skip ahead to this past year and you will find that I signed with an agent working with my previous agent AND sold not one, but several manuscripts previously shopped to the most enthusiastic editor that I could imagine. Oh and did I mention that I'm a lead title? What happened in between though? What the heck was I doing for those *missing* years? I'll give you a hint -- I wasn't sitting around waiting for everything to turn around. Were there ups and downs? Mostly downs! I was diagnosed with RA (rheumatoid arthritis), which made me nervous about my writing future, had a baby who stole my heart and a TON of time, and was so close to throwing in the towel it's not even funny. I already mentioned letting social media fall by the wayside. That's okay if you do it the smart way. I loved my little blog I used to post on twice a week. But when Martina mentioned the possibility of joining her here I knew it was the right move for several reasons. A. It was an established blog with a huge following. B. I could concentrate on something new and interesting that was relevant to where I was in the journey -- i.e. agents and contests. C. I knew I would learn a TON from Martina and everyone else here and I haven't been disappointed! Not everyone has access to publishing on an amazing blog like AYAP I get that, but here's my advice to you: Don't start a blog unless you KNOW it's something you love. Same with FB and Twitter and any of the other sites out there. You WILL burn out eventually but if it's what you love then the time commitment is worth it. I concentrated on the social media that I love and used shortcuts like IFTTT to help me post across platforms. And I found as I always did in the past that when I engage others with what I truly enjoy I find followers and make real connections with people. So by being in that somewhat humbled position I found that it was even more important to me to keep up with what meant the most to me and the interactions, in my opinion, are what it's all about. 2. You are never above the basics. Think you've seen it all? The blog posts, the workshops, etc.? Not true. Sometimes all it takes is someone repeating a single thing in a unique way that give you that aha moment. It's true that we grow as writers the more we do, but do you know how many adverbs I STILL have in my gosh darned manuscripts?? Grrrr. Yes, I catch a lot of them the first time through now, but they still sneak in there. So if you're having a tough time one of the best things you can do is go back and re-read some posts or a book that was there for you in the beginning. Sometimes something new will even leap out. You can even get something new to you, but on a subject you've seen so many times. Example? I re-read James Scott Bell's book PLOT AND STRUCTURE. I must have wanted to smack my forehead fifty times because of a simple thing I'd forgotten to pay attention to in my work. 3. The industry keeps moving, don't let it pass you by. I went through a period where I couldn't read. That makes me very sad. I LOVE READING and that's what inspires me to write. I felt some part of me was missing. Thankfully I read again now, just a bit slower than I used to. But it's SO important! I learn through, let's call it osmosis, while reading more than anything else I do. And new books in YA come out all the time. For a short while I didn't familiarize myself with the new ones, which is bad. Bad bad bad. You have to know what's out there in your genre. You have to know what's being done and what works and why. Why did you like it? Why DIDN'T you like it? 4. Be wary but not cynical. When you are "desperate" to get your work noticed you find all sorts of people ready to help. Do you hire an editor? Do you enter contests? Do you take any agent that offers? The answers are: Maybe, maybe, and NO. Hiring an editor is a personal decision. It's something that has helped many of my friends, but it's also expensive. My advice? If you decide you are stuck, meaning you don't have anyone else to ask and you don't know what's wrong but you're convinced either by rejections or your gut that you're missing something important then you are at a good point to potentially hire an editor. Before you do make sure they are reputable by asking for references and exchanging a bit of work to make sure their comments resonate. Try to find someone, if you're going to splurge anyway, that has professional experience with a publishing house under his/her belt. Contest-wise? Well, we're running Pitch Plus One right now! There are many online pitch or opening pages contests that are worth a look or a try. I myself got several requests a while back from Pitch Madness by Brenda Drake, who by the way got started on a contest here that I helped judge! Be careful. My advice? Never enter a contest that asks for money. Why? Not because they may not be reputable. Many are. Some aren't. But why do that if you don't have to? There are free resources out there if you search. Take advantage of our very own First Five Pages Workshop, for example. We never charge and have amazing mentors, including an agent, for every manuscript every month. Agent wise? Don't just take anyone that will have you. Take your time to research and ask questions. Ask for references. You are hiring them too. Get Publisher's Marketplace (or ask someone who knows) what their recent sales are like. Make sure you feel comfortable with them and understand their policies and procedures when it comes to communication, editing and submission. The wrong agent is worse than no agent. For reals. You can do all of the above, but if you are convinced your first manuscript has to be the "one" and you can't move on then you are far more likely to fail. You have to write. You have to write even if you are sad or doubtful or don't know what you're going to say. Take out an old manuscript that's been sitting for a while and read it through. Do you see errors you wouldn't make anymore? I did. Fix them. Can you think of something that would make it stronger? Add it! Do you see scenes that are superfluous? Chop 'em. Open a new document and start something new. Outline if you outline, start writing if you don't! The more you write, the better you will get. AND the more options you will have to offer a potential agent or editor. Pick what you think your weakest attribute is (writing wise, silly) and focus on it while you write or re-write a chapter. These tips may sound simple, but they sincerely saved my writing career. They work. So DON'T GIVE UP. Focus on your craft instead. There is always more to learn and do. "Soul Crossed blurs the lines between good and evil with addictive characters and plot that will have you eagerly turning the pages." — Kelly Hashway, author of the Touch of Death series. Great article, Lisa! And very inspiring for those of us still in the query trenches! Oops. I tried to put in my name and address and hit return after my name. Now I can't get back in to add my address. Is there a way to fix it? Anyway, just happy to hear your story! Ack! Sorry I'm technologically challenged, Rebecca! I hope you got it in there. Can you try again from scratch? Anyway THANK YOU for all your support. I'm glad I could inspire. Ah! What was I thinking? The simple yet effective trick of try again, different email. Thank you! And no problem on the support! The least I can do with all the help from #pitchplus5, the January workshop, and #pitchplus1! A huge hug to all you guys! Thank you for the advice! I really liked the book as an ARC and I am sure the sequel will be just as amazing as the first one was! Thank you also for the giveaway! Glad you liked it and that you found the advice helpful! Congrats on your new book, Lisa! So excited for you. And this is all great advice. Glad you didn't give up when you parted ways with your first agent. Glad you've sold so many manuscripts. Oh! That cover! Gorgeous. Thanks for all the good advice. Good luck with your latest book. Thanks, Rosi! I love it too! Congratulations, Lisa! Bought - can't wait to read! I'm so glad your story has a happy ending! I know you've,been instrumental in mine. Thank you for the giveaway ! Good luck to everyone.